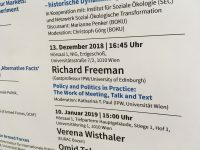 What are policy and politics, in practice? When we do politics and make policy, what are we doing? In this lecture, I want to set out a framework for understanding policy and politics in terms of the actions – the doings and sayings – that they entail. I begin by grounding this understanding in the interactionism of Arendt and Goffman, and explore the core phenomena of gathering, encounter and meeting. I reflect on the way each is instantiated in forms of talk, and supported and extended by documents and texts; I point to their material predicates, including human bodies, spaces and time. I conclude by discussing some of the ontological implications of thinking of politics in this way.